Home » NAB 2010 – You are There. Sorta. NAB 2010 – You are There. Sorta. You can get there from here is true enough if you let others do the dirty work of travel and hotel hopping. Vicarious tech thrills from shows like the upcoming NAB 2010 (which runs this coming Sunday through Thursday) draws out the bloggers ready to lay on video and audio reports of the latest gear. Which is to say that yours truly–NYC Production & Post News–will offer its own take in the guise of multi-hyphenate D.W. Leitner (DP-director-producer-journalist). Starting this Sunday evening, we’ll be posting a daily audio podcast of what David has seen that day that rises to the level of new and noteworthy. 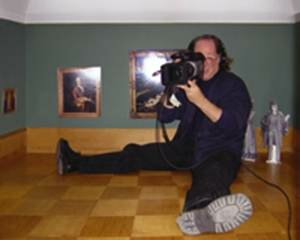 If you’ve ever read his millimeter magazine NAB blogs, you’ll know that he can swiftly render knowledgeable, unique overviews aided by his many years in literally all aspects of the film and video production and post industries. I’ll also be posting links to other tire-kickers such as the crew from The Digital Cinema Society (DCS). As in previous years, the group will provide streaming interviews with manufacturers from the NAB show floor. More info should soon be available soon on their site. The folks at FreshDV will also weigh in. Finally, if you want the official imprimatur, you can click on over to NAB Show Buzz: The Official Broadcast and Podcast of the NAB.